The Chinese Lunar Calendar has this year marked at The Year of the Rabbit. I do love rabbits (cute and delicious) and like the idea of marking the occasion with a very Burgundian kind of dish, a nice marriage of my French culinary inclinations and my family heritage. If you have never butchered a rabbit before, I urge you to get yourself a whole one and give it a go. You can watch a good how-to video featuring Marlow and Sons‘s Sean Rembold, or you can follow this pretty good step-by-step from Saveur here. Or you can have your butcher do it. That’s probably the easiest thing. Or, you can substitute a nice chicken for the rabbit. 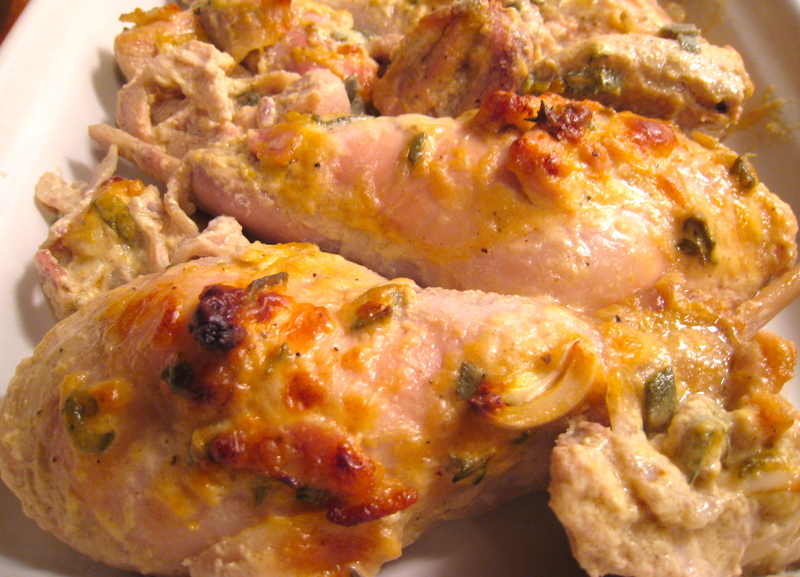 Chicken goes marvelously well with this sauce too. The sauce is amazing. Really, really great. Especially if you get yourself some very excellent pancetta, sliced very thinly (I love La Quercia). If you roast or boil some potatoes to sop up the extra creaminess, you won’t regret it. This recipe I think originally came from Chez Panisse. You have a little flexibility with the proportions depending on how mustardy you want it. 1. In a large bowl, cover the rabbit or chicken with all of the ingredients except for the chicken stock or white wine, and the heavy cream. Using your hands, mix everything together, making sure that all of the rabbit or chicken pieces are evenly coated. Cover the bowl and let everything sit at room temperature for about an hour, or overnight in the refrigerator. 2. Preheat your oven to 350°. After the rabbit or chicken has marinated for about an hour, spread the pieces out in a single layer on the bottom of a large cast-iron pan. Top the pieces with any remaining marinade. Roast the rabbit or chicken in the oven until they are cooked through, about 45 minutes. * If your rabbit or chicken is small, you might want to check it a little earlier. 3. Transfer the cooked rabbit or chicken pieces to a serving dish while you finish the sauce. Put the cast-iron pan on the stove over medium to medium-high heat. Add the chicken stock or white wine. Using a wooden spoon or a flat whisk, incorporate the added liquid to the sauce and pan juices. Add the heavy cream. Lower the heat so that the sauce is at a good simmer and reduce the sauce until it is thick and creamy. Adjust the seasoning* and pour it over the rabbit and chicken pieces. Serve immediately. If the rabbit or chicken appears to be drying out in the cooking, add some stock or white wine to the pan. As the mustard and pancetta add a good amount of salt themselves, adjust the seasoning at the end so that the dish doesn’t end up over-salted. Hello Blue Squid! Thank you for dropping by and thank you for the kind comment! I’m so glad to hear that the recipe worked out. In many ways, rabbit is not so different that chicken to cook, and I find that all recipes with mustard are very versatile! Thank you again for letting me know how the dish turned out and I wish you a super week too!